The San Diego divorce attorneys at The Law Office of Doppelt and Forney, APLC are here to help you through your divorce, legal separation or paternity case. We offer all potential new clients a free 30 minute consultation directly with an attorney. At your consultation, the attorney will provide you with legal analysis, techniques and strategies to help you obtain your legal goals and ensure your rights are being protected. As a full-service law firm, we handle all of the often confusing pleadings and motions for you, always with your best interests in mind. We prepare the petition and summons and all the initial dissolution pleadings for filing with the San Diego County Superior Court. We will assist with the mandatory preliminary declarations of disclosure including the schedule of assets and debt and income and expense declaration. Our firm assists with the preparation of all pleadings and court appearances as necessary including the family resolution conference. We also handle post-judgement motions including motions for modification of child land spousal support and the parenting plan as well as motions to set aside the judgement and enforcement of the judgement. A Humanist wedding is a wedding that is non-religious. 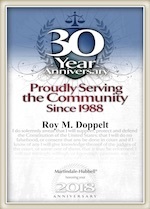 The Law Office of Doppelt and Forney, APLC practices in all aspects of family law. This includes divorce, legal separation, paternity, child support, child custody and visitation, spousal support, prenuptial agreements, and more. Choosing a divorce lawyer is an extremely important decision, and making the right decision can be stressful. Below are a few tips to help you make the right decision for your needs and goals. 1. Do your online research. We recommend reading reviews on Google and Yelp to get a better idea of client satisfaction and work styles. Because divorce is such an emotional time, don’t run away just because there are a few negative reviews. However, if you notice a pattern of negative reviews in combination with few (if any) positive reviews, that should be a red flag.